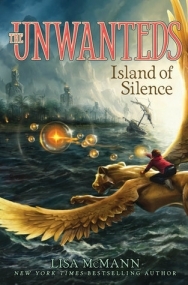 Following the life-altering events at the conclusion of "The Unwanteds," the stark world of Quill and the magical haven of Artimé are now home to whoever wants to live there, whether they are Wanteds, Unwanteds, or Necessaries. In Artimé, Alex Stowe and his friends continue to hone their artistic magical spells while welcoming newcomers, wondering how long this peace between Quill and Artimé will last. Alex is stunned when Mr. Today comes to him with a very special request — one Alex questions his readiness for, until circumstances offer a dramatic answer. The first half of Island of Silence lacked a bit of the magic and mystery The Unwanteds had, but it was also necessary. Artime had to put itself back together after the fight and try to work the Necessaries that joined into the daily Artimean life. I actually really appreciate that McMann didn't immediately introduce some new mystery or problem. While, it wasn't quite as edge-of-your-seat as The Unwanteds, it was nice to have a little normalcy worked in before things got crazy again. Admittedly, I was a little bored for a while, but it's easier to appreciate after you've been thrust into the craziness. I liked seeing the growth in Alex. He was able to start coming into his own in Island of Silence and I'm really excited to see how he continues to grow in the next book. I wasn't really impressed by Lani's jealousy of Alex and what he'd been offered. I can understand it to a point, but in the end it didn't really come to anything. It might come into play in the next book, but as for this installment it only served to create an opening for plot movement and make me like her character a little less. The Nutshell: The first half was a bit too meandering for my taste, but it was necessary for the story and the second half more than makes up for it anyhow. This is the first time I've been crazy excited for a next-book-in-the-series in a while.